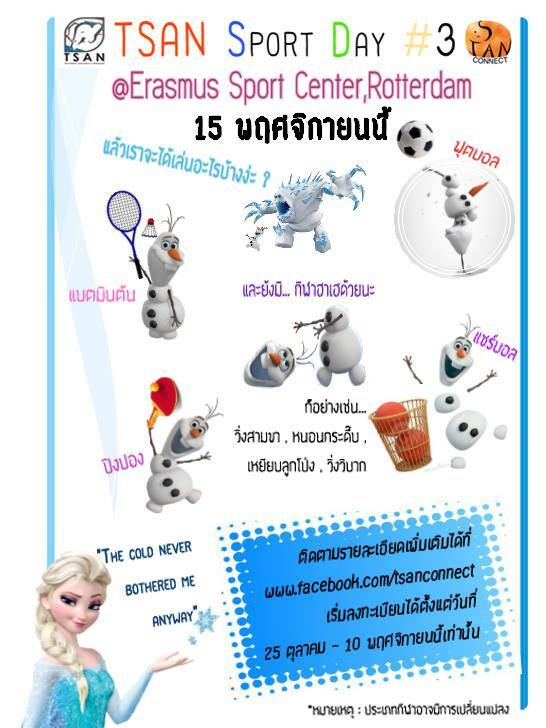 ‘TSAN SPORT DAY #3’ will be held on November 15th, 2014 at Erasmus Sport Center*. Looking for a fun and sporty event? Don’t be heitate to join us!! Participants will be divided into 4 teams, each team mixed randomly. 12.15-12.30 Participants are divided into groups and players for each sport are selected. 2. Transfer the Entry fee: 10 Euros – Account detail – T. Boonyabovonviwat – Account number – NL95INGB0682019569 – ING Bank – Please specify your name and ‘TSAN Sport Day 2014’ in the detail of the transfer. – This fee is spent on venue and equipments. Two drinks from Erasmus Sport Center are included. – Dinner is not included. The cost of dinner will be shared among those who join. – The payment must be done within 10th November 2014. – If the payment is not done within the deadline, the registration is incomplete. Then you have to pay 15 euros at the event.